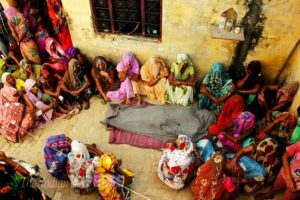 On Friday night, while the nation was glued to the television sets watching live telecast of no–confidence motion in Parliament and the newsrooms debated the political correctness of hug and wink, the rants, half truths and lies and what not … another innocent person was killed by cow-vigilante mob in Alwar district in Rajasthan. A GroundXero report. A 28 years old man named Akbar Khan was beaten to death on Friday night by villagers in Ramgarh on suspicion of cow smuggling. Akbar Khan, a resident of Haryana along with his friend Aslam, was taking two cows to their village. 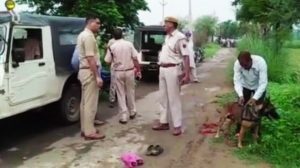 While passing through a forested area near Lalawandi in Alwar district of Rajasthan, a mob of villagers attacked them. Khan was rushed to the government hospital in Ramgarh, where doctors declared him brought dead. The other man accompanying him managed to escape. Chief Minister Vasundhara Raje has condemned the incident and promised stern action. So far, police have made two arrests. 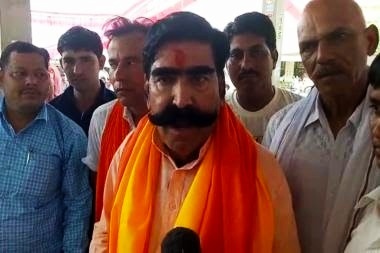 According to ANI, BJP MLA Gyan Dev Ahuja called him a cow smuggler and demanded a judicial enquiry to ascertain whether he was lynched by the mob or beaten to death by the police. The MLA told UNI, “the public slapped the cow smuggler a bit and informed police. Sources told me that the police took the cow smuggler into custody and thrashed him to death to show the people that they are taking strict actions”. Interestingly, Alwar happens to be a district where Chief Minister Vasundhara Raje has established Gau Raksha police stations. 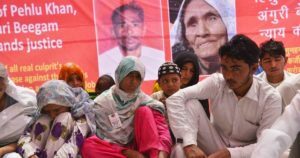 Anguri Begum, mother of dairy farmer Pehlu Khan along with her family members stage a sit-in demonstration to demand justice. New Delhi, 19 April 2017. 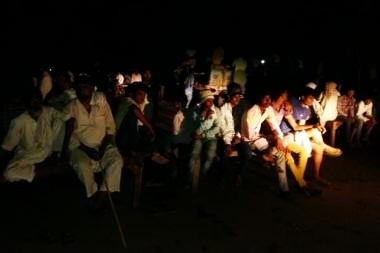 This new lynching incident happened barely a year after a similar such incident took place in the same district when 55-year-old Pehlu Khan was beaten to death on 1 April by cow-vigilantes while transporting cattle from his dairy farm. The mob, accusing Pehlu Khan and his companions of being cow smugglers, attacked him. Pehlu succumbed to his injuries two days later in hospital. A video recording of the lynching went viral over social media. The incident triggered national outrage against such vigilante groups. The brutal killing of Akbar Khan took place just a few days after the Supreme Court made strong observations regarding a spate of such lynching incidents occurring all over the country. 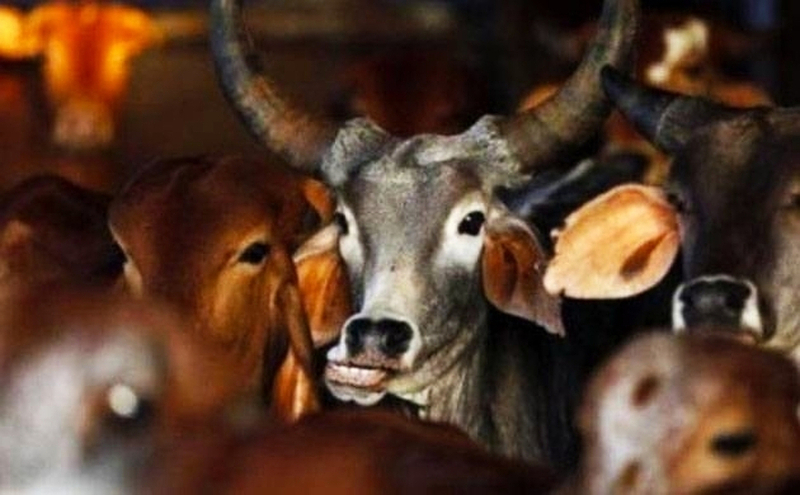 On 17 July, a panel led by the Chief Justice of India, Deepak Mishra, recommended that Parliament pass a new ‘special law’ that would instill fear among the lynchers. The court observed that such “horrendous act of mobocracy cannot be permitted to inundate the law of land. Lynching cannot be allowed to become a new normal’’. Earlier, a group of 67 retired civil service officers wrote an open letter to the Prime Minister asking for ”firm action against perpetrators of hate crimes in the country.” The letter alleged that in every such case either the accused are not arrested or let off rather easily. Lynching, which means killing of individuals by mobs, is not listed as a separate crime in the Indian Penal Code (IPC). On 18 July, Union Minister of State for Home Affairs, Hansraj said in Rajya Sabha that the government does not maintain specific data on lynching incidents in the country. National Crime Record Bureau does not record data of mob lynching. The data can only be gained from media and fact-finding reports. According to an analysis of media reports by web portal India Spend, 25 persons were killed in 60 cow related incidents between 2010 and 2017. 97% of these incidents were reported after Narendra Modi came into power in 2014 and 84% of those killed were muslims. Since last 4 years, numerous cow-vigilante groups have sprung up across many states of the country. Lynching and mob violence are no longer isolated incidents relating to law and order. Neither are they happening in a political vacuum. There is a general feeling that these incidents are the outcome of the politics of hate and intolerance being spread by RSS-BJP and their numerous affiliates. While Modi’s ‘vikas’ has only gained the confidence of Ambanis and Adanis, the common man reeling under the impacts of demonetization, GST, bank debts, rising oil prices, agrarian crisis can only be kept under his magic spell by fueling the narrative of cow-muslim-hindi-hindu-nationalism. They believe that the resultant religious polarization of this political discourse, in collusion with corporate money power will help sail them through 2019 elections. Lynching mobs know that they can get away with whatever they do, since ‘their government’ is in power. 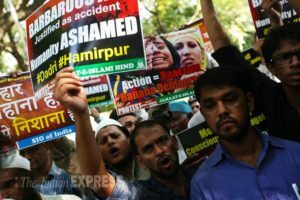 It is no longer even ironic that the latest incident took place on the day the Prime Minister in his reply to the debate on No-Confidence motion said in Lok Sabha, “Any instance of violence brings shame to the nation”. The Home Minister also ‘condemned’ incidents of mob lynching putting the onus on states holding them responsible for law and order situation. But the question the PM needs to be asked – if he is so concerned about deaths caused due to mob lynching by Gau Rakshaks – is why is he so silent about the inhuman, insensitive remarks made by his MPs, party leaders and even cabinet colleagues on these gory incidents. A few examples will bring this out. In June 2018, Nishikant Dubey, BJP MP, announced he would bear the legal expenses of four persons accused of lynching two men in Jharkhand. On 17 July, social activist Swami Agnivesh was assaulted by BJP party workers in Jharkhand in broad daylight. The entire assault was caught on camera, but, not a single person has been arrested. On the contrary, BJP leader and Urban Development Minister CP Singh justified the attack calling Swami Agnivesh ‘anti-hindu, anti-national’. On 9 October 2017, 15 of the youths accused of lynching Mohammed Akhlaq in Dadri over suspicion of storing beef in his house were given contractual jobs with NTPC Limited. Tejpal Nagar, the local BJP MLA, facilated their recruitement. Gulab Chand Kataria, Home Minister of Rajasthan dismissed Pehlu Khan’s lynching as a case of ‘manhandling’ and remarked “there are two sides to this”. 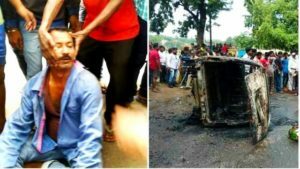 On 29 June 2017, the day the PM said, “killing people in the name of Gau Bhakti is not acceptable”, Alimuddin Ansari was lynched by in Jharkhand on suspicion of carrying beef. In March 2018, a fast track track court convicted 11 persons including a local BJP party leader of the murder. 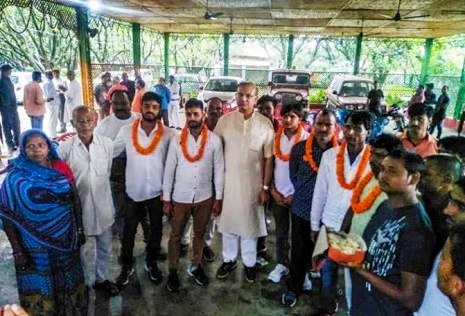 On July 18, after the accused got bail from High Court, Jayant Sinha, MP from Hazaribagh and a minister in Modi’s government, crossed all limits of decency, when he felicitated the eight accused of lynch murder by offering them sweets and garlanding them at his home. The list can go on and on. These are clear signals to the foot soldiers of Hindutva lynch mobs that their cause would be championed by the government and the ruling party even if compulsion of being in power makes the top leaders strategically distance themselves from the accused now and then. Electorally, lynching politics might as well win upcoming elections for the ruling party, just like the Gujarat genocide worked to cement it’s grip over the state for decades. But the question of lynching becoming the new normal, has gone much beyond mere elections now, and is facing the Indian society and it’s morality at large. Akbar Khan is just another victim.